Ingredients: Organic black bean flakes. Directions: Add 1/3 cup boiling water to 1/3 cup mix, stir and let stand for 5 minutes. Yields approximately 1/3 cup. 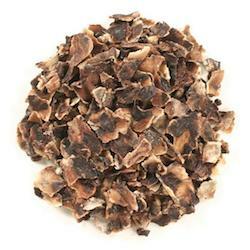 Suggested Uses: Black Bean Flakes provide a convenient source of fiber from dehydrated black beans. Add to savory dishes such as burritos, salads, hummus, soups and dips. When folded in water, milk or cream, black bean flakes act as a thickener.